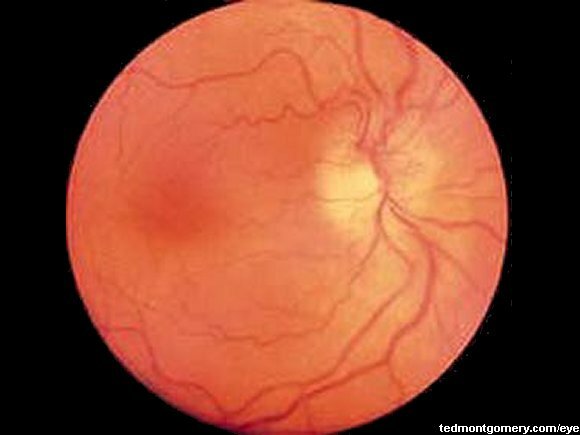 This is a rare but important form of vasculitis in those of middle age and beyond which can cause irreversible sight loss due to occlusion of the posterior ciliary artery which supplies the head of the optic nerve which can result in an anterior ischaemic optic neuropathy which if bilateral causes complete blindness. Early diagnosis and treatment with high dose steroids is vital to prevent progression to the unaffected eye. It is an Ophthalmic emergency. GCA affects both sexes but is commoner in females. 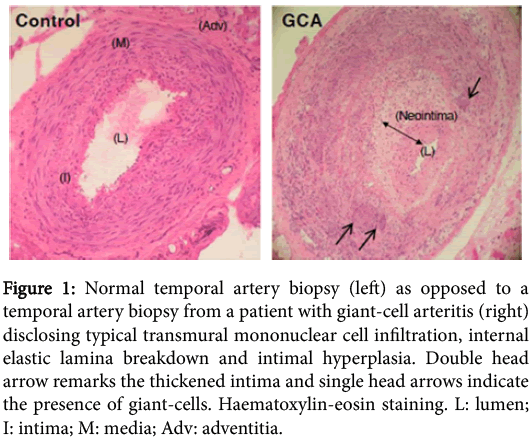 In GCA there us inflammation of small and mid sized arteries usually affecting the external branches of the carotid artery with vascular narrowing. 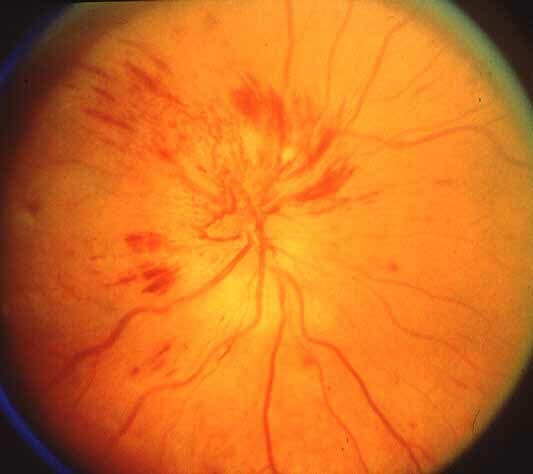 Most commonly the inflammatory vasculitis may affect the superficial temporal arteries and posterior ciliary branch of the ophthalmic artery. It is thought that the immune attack may be to the internal elastic lamina of the vessel wall. Involvement of the internal carotid artery and its branches is uncommon. Patients are usually over 60 but some present earlier. They may complain of days or weeks of headache, myalgia. There may be jaw and even tongue claudication precipitated when chewing. Inquire after systemic symptoms including weight loss, malaise, fever. Seen as they may present like a TIA with transient or permanent monocular visual loss. Visual loss may be misdiagnosed as amaurosis or migraine. Fundoscopy in an affected eye with an anterior ischaemic optic neuropathy shows white optic disc oedema with splinter haemorrhages along the disc margin. 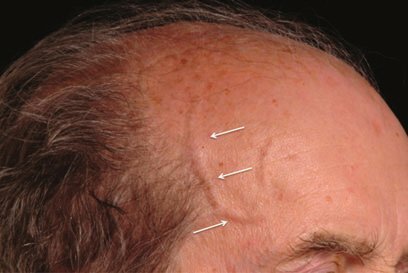 There may be thickened nodular temporal arteries with tenderness. There are exceptional presentations with stroke which may be anterior or posterior circulation. Strokes however may simply be coincidental and are not uncommon in this age group. FBC: there may be a non specific normocytic normochromic anaemia. ESR and CRP: The ESR is usually markedly elevated at over 100 mm/hr and should at least be over 50 for the diagnosis. The CRP should also be elevated. ALP: There is often an elevated ALP is also seen. Temporal artery ultrasound may show distinctive thickening and a halo appearance due to swelling and oedema in the vessel wall. The halo usually disappears with treatment. Temporal artery biopsy (TAB):needed within days of starting steroids. The key finding is the presence of giant cells and inflammation of the vessels. The pathology is patchy with skip lesions so a negative biopsy may mean failure to biopsy affected segments of the vessel. *The Sensitivity of the ACR criteria ARE 93.5% and a reported specificity of 91.2% for the classification of giant-cell arteritis compared with other vasculitides. Stat dose of Prednisolone 1 mg/kg usually is given and usually results in a dramatic reduction of other symptoms too. 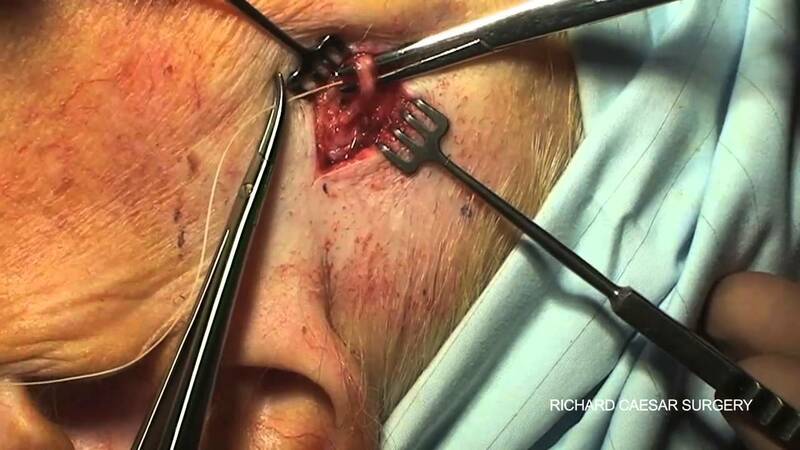 A temporal artery biopsy is the gold standard and should be done within days but treatment is often continued when biopsy negative if the other criteria are meet. Temporal artery ultrasound may also be useful. Steroids are reduced slowly over 18-24 months titrated to clinical response and ESR/CRP. Steroid sparing agents may be used. Other more potent anti-inflammatory treatment may be given if there is suspected cerebral involvement. Start Osteoporotic Bone protection. Advisable to also consider Aspirin 75 mg od if tolerated as well as good BP and vascular risk factor management. Sadly most patients with GCA experience steroid related complications. These are not insignificant and particularly in patients of advanced age have associated morbidity and even mortality and include diabetes mellitus, osteoporosis with vertebral compression fractures and Cushing syndrome. Steroid sparing agents such as methotrexate have not shown equivalence.